October 16th, 2015. 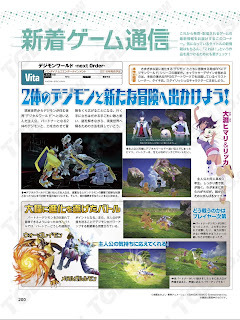 Chinese gaming news outlet TGBUS has uploaded scans from an unnamed Japanese gaming magazine, unveiling new information about the upcoming Digimon World -next 0rder- on the PlayStation Vita. The magazine is currently presumed to be the most recent issue of Weekly Famitsu based on the timing and similarities in page formatting. Assorted translations are provided below. This week's issue focuses on the dual Digimon battle system, and confirms existing suspicions that the "certain village" mentioned in Jijimon's profile is the Village of Beginnings. It also contains a profile for Oofuchi Himari, which identical to that found in her official profile. The battle screenshots show Agumon and Gabumon teaming up, and provide a bit of explanation as to how the game's cheer system works; when the player cheers for their Digimon at the moment of an attack, it briefly powers up the Digimon. 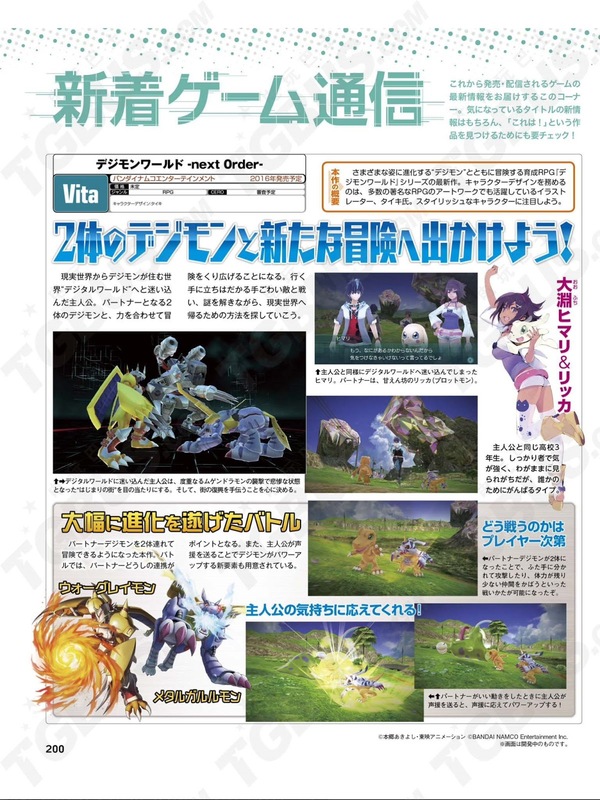 No exact release date has been decided on as of yet; the magazine still lists Digimon World -next 0rder- for 2016. This is the latest work in the raising simulation RPG series Digimon World, where the player adventures with the Digimon that evolve into many forms. Serving as character designer is the illustrator who has done artwork for numerous RPGs, Taiki. Pay attention to his stylish characters. Go on a New Adventure With 2 Partners! The protagonist wanders from the real world to the "digital world" where Digimon reside. Alongside their 2 partner Digimon, they embark on an adventure. While confronting formidable enemies, and solving this mystery, they search for a way to return to the real world. Wandering the digital world, the protagonist sees the "Village of Beginnings" repeatedly lain waste to by Mugendramon before their very eyes. They then decide to assist in the reconstruction. By befriending 2 partners, you can go an adventure. In battle, cooperation between partners is an important point. Furthermore, by hearing the protagonist's voice the Digimon power up and new components [of battle] are made ready. When there are 2 partner Digimon, the two of them will attack separately, and if their strength isn't low it's possible they will protect one another while fighting. When the partners make a good move and they hear the protagonist's cheering, the cheer powers them up!